I love when I find a product that not only is a perfect solution for something in my life but when purchasing it can mean giving back to a great cause. That is one of the things I love so much about the direct sales industry – every company has charities and causes they support – it isn’t just about making money, but it is about giving back and doing good for others. Independent Initials Inc Creative Leader Laura Blackburn sent one of these products in for the 2016 Diva Holiday Gift Guide. The “YBL Case” from Initials, Inc is not only a product that every single woman needs, but every purchase gives back. YBL Stands for Your Best Life – just exactly what Initials Inc wants you to have! This cute little case measures 7″W x 2.25″H x 3″D and has a little mirror inside. The kiss-lock closure keeps all of your goodies locked securely inside. The YBL Case comes in several different prints – there is even a camo print for the guys! 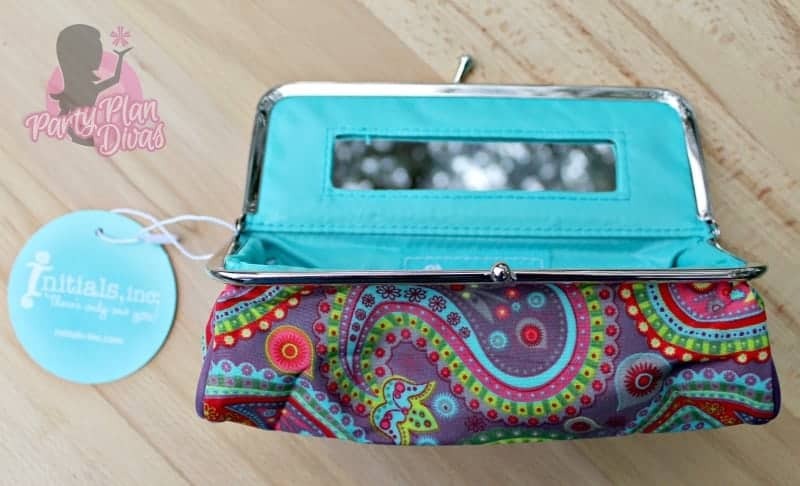 It is the perfect size to hold makeup, hair accessories, phone chargers, snacks, baby essentials, oils, nail polish – almost anything! Not only is this the perfect little carrying case for anyone, but every purchase of the YBL Case sends $5 to the Bethany N.O.W. Campaign which helps children in the foster care system find their forever homes. Independent Initials Inc Creative Leader Laura Blackburn sent me their super popular YBL Case in the Sugarplum Paisley pattern! We just love it! Initials Inc offers a large line of products for your home and office – many of which can be personalized for free! Initials Inc offers everything from purses and wallets to organization and storage containers. They even have beautiful oversized scarf wraps which would be perfect for this time of year! Their quality is incredible and their products will last for years – I know – I have been using one of their Initialed Train Cases for more than four years! Initials, Inc has been providing beautiful products for more than ten years – with FREE personalization! As an Initials Inc Party Host, you can earn free and discounted products for sharing with your family and friends! As an Initials Inc Creative Partner, you can build a business helping people choose and personalize their favorite bags and accessories! Check out Laura’s website to learn how you can get involved with Initials Inc!